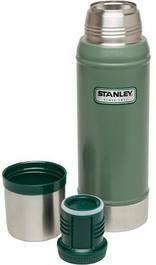 A sturdy steel thermos with 750 ml capacity. Stanley Classic 0,75 L Vacuum - A sturdy steel thermos with 750 ml capacity. Cleaning tablets for hydration reservoirs. Spare part set containing hose and drinking head. A pocket flask made of steel, with impeccable style. Drinking tube for Ortlieb water bags etc. The legendary bottle with high quality coatings.